Well hello there & happy November friends! We are back from Iceland and this was one of the coolest vacations we have ever taken. We saw so much, but agreed that with it being so close to Boston we have to go back in a few years to see even more! 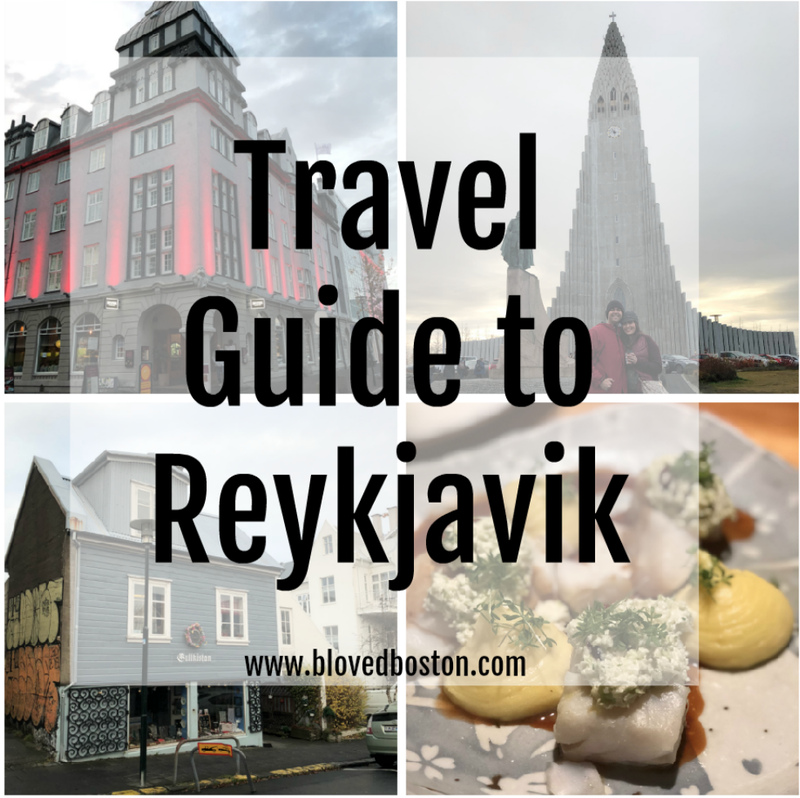 I was trying to think of the best way to divvy these posts up and I think starting with Reykjavik and everything we did in the city, where we stayed and where we ate, which could be a post in and of itself, then sharing about the day trips we took will be best! So stay tuned for part two next week! Warning - there are a lot of food photos here because the majority of what we did in Reykjavik was EAT! ^upon arrival we were greeted with delicious hot chocolate^ Reykjavik is a pretty small city and to me everything seemed to be city center, but for the purposes of this guide, I'll say the shopping streets would be city center. Even if you don't stay in the city center you won't be far from all the shops and restaurants. 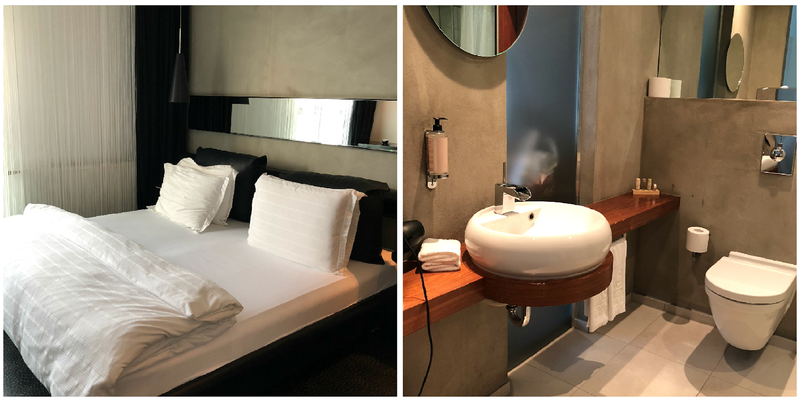 We looked at a lot of the hotel options, a few AirBnB's and decided on CenterHotels - Thingholt. There are actually a ton of CenterHotels around, but this one is right next to the main shopping area. I really loved the location of the hotel and the staff was very friendly and accommodating. I ended up coming down with a cold the day before we left, so I was in desperate need of lots of tea which they kindly gave me every night. With free wifi included and the complimentary full breakfast it was a great place to call home for a few days! I wasn't expecting much from the breakfasts and we had every intention of dining out for all our meals, but it was packed full of everything you could want, including their delicious local yogurts which I had ever day! 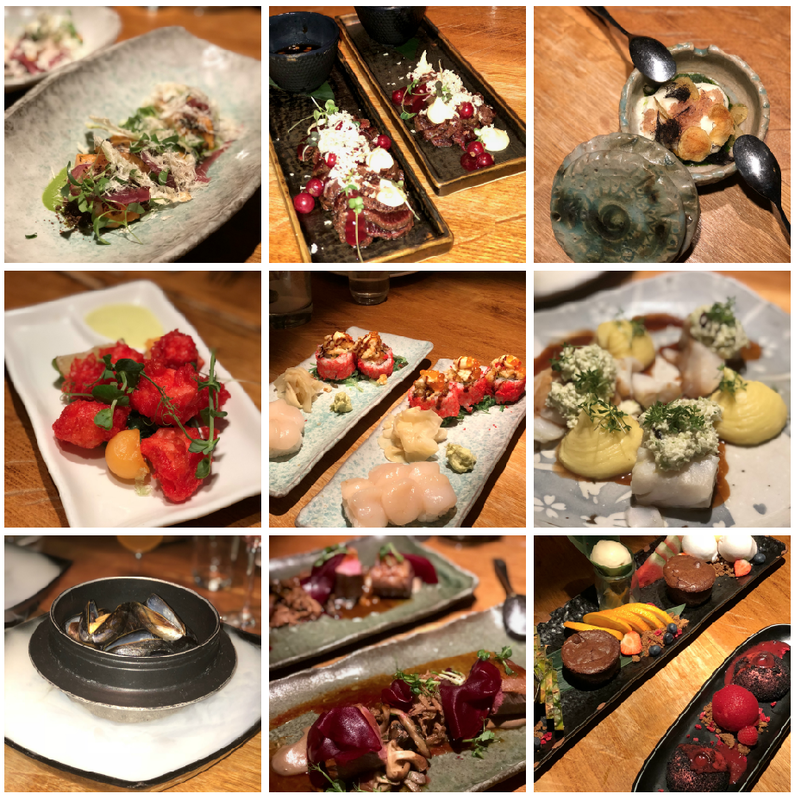 Before leaving for Iceland, I didn't know what to expect from the food scene - especially since I saw that they were known for fermented shark & puffin - both of which I did not try! I am extremely happy to report that the food in Iceland is incredible & everywhere we ate had the freshest and most delicious meals. Also, if you never reach for the bread basket - I highly suggest that you give yourself a pass in Iceland and eat their delicious bread! For the most part we really only ate dinner out & packed a lot of snacks for our day trips because we weren't sure where we would find restaurants in the middle of nowhere. All of the restaurants were extremely accommodating to our party of 6 - we rarely had to wait & they were happy to give their WiFi passwords out to those of us that didn't have an international plan on our phones...like me! I also want to note that everywhere we ate was extremely conscious of food allergies since we had a couple in our group. While everything is definitely more expensive in the country, I found that drinks were especially priced high - so keep that in mind! Kopar || We ate at Kopar for lunch on our first day. We were all starving & tired after the Blue Lagoon - so all we wanted to do was eat and take a nap. Gary and I split the Rock Crab Soup (delicious) and each had our own fish & chips (best we've ever had). Caruso || Dinner on night one was this cozy little Italian restaurant on one of the main streets downtown. We were pretty tired from not really sleeping on the flights, so we just wanted something hearty. While this was a delicious pasta dinner - I think our level of fatigue won out and we just wanted something easy. Wouldn't say skip this if you are ever in Iceland, but if you have the option go to the other restaurants I mentioned here, then start with those. Fiskmarkaðurinn or Fish Market || Hands down my favorite meal in Iceland and probably on the list of my top meals ever! We all had the nine course tasting menu that was served family style and included dessert. I decided to photograph every course because not only was the presentation incredible, but every single bite, even the little bit of whale, was tasty. Fish Market is not to be missed & definitely make a reservation! So many of my friends recommended this restaurant and I can absolutely see why! Maybe it was the 9 courses that we were eating or the late start to dinner, but this was our latest night out & probably the most fun I've had at a dinner in a long time! Grillmarkaðurinn || This restaurant is actually right next to Caruso, so when we were leaving on our first night we made a mental note to come back here because the decor and ambiance looked really cool. We were so right to go back and eat here because again the food was so amazing. We opted for a really early dinner that night because we had a tour to see the Northern Lights, fortunately for us the bar was open and we all basically got a first hand view of the chef's creating all the dishes. It was so fun to see them work & see the care that they took in bringing the dishes to life. We got the fish gourmet which was 3 different types of fish with the most delicious garlic mashed potatoes & their grilled corn cobs on the side. Holy-amazingness - that salmon was most definitely the best piece of fish I've ever eaten and I really love my seafood! Matarkjallarinn - Foodcellar || While at dinner one night (yes we are those people that talk about our next meal while we're currently eating 😁) Jackie & Tom passed a cute little restaurant that happened to have almost 5 stars on Yelp & TripAdvisor so we decided it was the best spot for our last dinner in Iceland. They had a live piano player that definitely made dinner a little more fun - there was even a point during the dinner when we were "those" Americans, singing not quite at the top of our lungs to a love ballad! The scallops were my favorite part of the dinner, while the langoustines - a cross between a crayfish and lobster was my second favorite. The dessert was pretty stellar - I would probably go back for the cinnamon bun alone! Admittedly we did not spend as much time in the city as I would have liked and there is plenty to do while there including museums & the Harpa, the country's concert hall. We did most of our sightseeing on the last morning / afternoon and this is one of the reasons I would love to go back to Iceland for a long weekend! Hallgrímskirkja Church || Probably the most famous building in the city as well as one of the tallest. You can go up in the tower to see the entire city, but unfortunately for us the church was closed due to a funeral so the views will have to wait until next time! Famous Hot Dog Stand || I probably could have put this under the "eat"category, but I think it's more of an activity rather than full meal. A couple months before we left, Jackie sent us an article about the best hot dog in the world being in Iceland - so random! This little stand on a corner in the city works like a well oiled machine! You definitely want to get this fully loaded because they have a special sauce as well as ketchup, mustard & crunch onions. While I can't really say if it was the best hot dog ever, you go more the experience and for that I give it an A! A little shopping || Everything is pretty expensive in the country and while we didn't do any shopping except for an ornament for our collection and some souvenirs for my nieces and nephew - we still enjoyed walking around the two main shopping streets and taking in all the culture. Just stroll around the city & you'll see the cutest little homes & fun architecture. The city is a nice mix of European charm & Coastal New England town. They say that Reykjavik is very reminiscent of a Norwegian city. If you're a fan of the Big Lebowski then you can always pop into the bar dedicated to the movie! Hljómskálagarður Park || We passed this little park on our way in and out of the city, so before leaving we walked from our hotel to check it out. There is a track that's great if you want to get a little run in or if you have kids, there was a playground they could enjoy or just feed the ducks and swans! Cafe Paris & Laundromat Cafe || I already mentioned that we only ate breakfast at our hotel, but we wanted some good coffee and heard that Laundromat Cafe was one of the best places in town. We also decided to get coffee from Cafe Paris on one of the mornings before heading out for the day and that gave us a good excuse to walk around the town center. There is so much more to see and do in Reykajavik and we really do want to go back for a long weekend at some point! It looks like all we did was eat and I'm pretty okay with that!! I'm excited to share part two of the Iceland Adventure next week! Have you ever been to Iceland? Would you ever visit? What a wonderful adventure in Iceland!!! You guys look so cute and cozy and oh the food, the food!! And look at the cool architecture.....would love to go there sometime! No wonder you want to go back! What a great guide to Reykjavik! I have always wanted to visit Iceland and after seeing your pictures all weekend, I really want to go! I was curious about the food too, but all the food looked amazing! Good to know about the bread, too! And you're right, it is really close for us on the East Coast! Looking forward to the second part next week! What a fun trip! Isn't Siggi's yogurt Iclandic yogurt? I would love to eat that fresh every morning! Can't wait to read about the rest of your trip! Your trip looked so amazing & it was so fun to follow along! Who knew Iceland had such amazing food? Random, but my favorite food is a hot dog so that definitely looked awesome! ha! It looks like you guys had a wonderful time and all of the food looks amazing. I would definitely love to visit Iceland and I have been looking forward to these posts. I can't wait to read the others that you do. So.much.fun! Such beautiful pics and so much delicious food. Now i wamt to visit 🇮🇸! This is bringing back so many yummy memories! I can see that there have been a lot of changes since I visited 2 years ago, it's definitely the travel hot spot! I was blown away by breakfast each morning in our hotel as well, my cousin would laugh at me because I centered our mornings around that delicious meal lol. I didn't realize before I went that Iceland was such a foodie spot! Can't wait to see the day trip photos!! All of this food looks SO GOOD!! I loved following along with your trip- it looked awesome! Iceland is on my bucket list!! Goodness gracious all these food pics looks AMAZING!! I'm so glad you guys had such a good time! The only thing I’ve ever heard about Iceland is the Blue Lagoon, lol, so this was a great read and introduction to learning more about the culture through the food! I didn’t know they big on eating shark, I don’t know if I’d be able to indulge in that tradition, but it’s interedting. I’m definitely one of those people that plans their next meal while eating, so I get it. All of these places look white delish and the food looks comforting. Thanks for sharing, beautiful, I can’t wait to read part 2! This is so awesome, totally saving for when we get there. Love all the food, it looks super delicious and cheers to free wifi. When we were in Europe for our month lunches were always decided by the WIFI sign so we could chat with family or post on our blog. Ugh, everything is so so expensive over there. In our stopover flight we snagged some snacks because our flight was delayed and we couldn't eat dinner and it cost a fortune, we laugh about it now. Definitely no shopping for us. Love that you do the ornament tradition, too. I know very little about Iceland, so I would have no idea what to expect from the food either, but everything looks soo good! It sounds like Reykjavik is such a cool city- I love when places are all walkable for the most part, and I'm sure staying right in the center of everything made it so easy to get around. Looks like you all had a great time. I have been thinking about visiting Iceland but to be honest, I'm such a picky eater that I was a little hesitate to go. I think you just changed my mind. It is such a quick trip from Boston. haha. Looking forward to hearing more about it. Welcome back. i love that you went like, yesterday, and already have a recap heehehh xox MISS YOU! You are so on top of your recaps! The food looks so good and I loved following your trip along. It looks like it was such a fun trip! Everybody is obsessed with Iceland and it's so easy to see why! I definitely wouldn't have though about Reykjavik for the food, but it looks like y'all had some great food! I loved seeing all of your Instagram posts from your trip, and I can't wait to hear more about your trip! These pictures are giving me some serious wanderlust!! That food all looks SO YUMMY!!! And the church is so unique! Love that you had such a good time--can't wait to see more!!! This trip looked so amazing! I loved keeping up with you on Insta!! It really is pretty close to Boston so that is great! Can't wait to read more! It sounds/looks like you had an amazing trip - I can't wait to hear even more about it! All I know is right now I want ALL the food. Everything looks so fresh and delicious! Omg so much fun and the city looks so pretty and charming! Not to mention the food! Yum!! I totally thought of you as I caught up on my RHOC, when they were visiting Iceland. So glad y'all had fun! Ahhh you know I love a good travel post. This just makes me really want to visit Iceland. You say its close to Boston, how long is the flight? And what made you chose Iceland? Iceland looks amazing and this is on my list! You ate so well and look so cozy in your winter gear. I love all the architecture and that church is amazing! What a bummer you couldn't go in it, but all the other stuff looks amazing! What an amazing trip, Biana!! Oh my goodness, I never knew I needed to go to Iceland, and now I do!! I need to add it to my bucket list! And that church is gorgeous! I had so much fun following along on your trip on Instagram. All of the food you ate looks and sounds so incredible!!! That is my favorite thing about traveling, food! It is the highlight of any trip, near or far for me. I remember my friend who just visited talked about the worlds best hot dog too. yum! But that same cathedral was just on the show last night! Fabulous! Iceland Air is flying out of Philly now too so it's been on my radar. I'm starving after reading this post lol! How far is Iceland from MA? I didn't know it was that close. Is it super cold there or the same weather as here? It seems like you had a fun trip with your friends! The food does look wonderful. I never pass on bread, ha. How neat that it is all pretty centrally located too. Love your photos. It looks awesome there! The food looks amazing. I'm literally looking at airplane tickets now! All of this looks amazing!! The food looks so good, especially the seafood. I bet it's so fresh. I had no idea there would be so many brightly-colored buildings, too. Those dishes look delicious! Such an awesome place. Really cool sites and scenes you got to experience. The cuisine looks amazing!!! Definitely pinning this for later because you seemed to find all the good food!! I've heard there's this super awesome boutique hotel that is supposed to be opening this spring, too. I would love to head that way when there's a chance of seeing the northern lights! We stayed at one of the 1million Centerhotels in town as well :) I'll have to use your restaurant recommendations next time I go -- seems you went a bit fancier than we did!